A ‘War Refugees Committee’ co-ordinated voluntary relief work nationally and more than 2,500 local committees, supported by local authorities, were set up across the country. Hundreds of charity initiatives and events were organised to support the refugees. What was the response of the Biddulph community to the call for help? Can opinions of both locals and their guests be uncovered? Were they welcomed eagerly into the community? Is there evidence of tensions, differing attitudes, resentment or suspicion? Although sources of information are sparse it is hoped that some impressions can be gleaned which will provide insight, limited though it may be, into this period. Sources used include press reports that appeared in both the Chronicle and the Staffordshire Weekly Sentinel, St. Lawrence Parish Magazines for 1914 and 1915 and local knowledge. However, the local community sprang into action in terms of fund raising for the Belgian cause. In December 1914 the junior branch of the YMCA had donated to the Belgian Refugees Headquarters: three vests, five scarves, three bonnets, four hats and four dolls (St. Lawrence Parish Magazine for December 1914). A concert given by the Royal Olympic Co. at the Public Hall was one of the first major events followed by the ingenious idea promoted at the Crown and Cushion “of throwing coins on the ceiling with a cork and tin tack attachment” which raised £1. Events were eagerly organised by many groups and individuals. News that Biddulph was to entertain 30 Belgian refugees forced action; this appears to have been as a result of the ladies of the parish and not the committee set up back in November 1914. At the beginning of February the Sentinel informed readers that, “Belgians for Biddulph – Thirty Refugees to be Entertained.” This led to the formation of a ‘Ladies Committee’ with the aim of providing for a party of six refugees at the Knypersley Hall cottage. Mrs. Heath presided over the meeting. Their objectives were practical; to source furniture and other items required for a home for the refugees. As they were now expecting thirty they also needed to raise more funds to support them. Donations and gifts of money, household items and such were needed. The newspaper printed a long list of names and details of either cash promised or items to be donated. Newspapers reported on the generous support given to the Belgian Refugees’ Fund during February. There were gifts of furniture, groceries, vegetables, household utensils and so on. The Sentinel reported that the cottage at Knypersley Hall was now occupied and a house in John Street was being prepared. Requests for items included: blankets, sheets, pillows, cutlery, a coal scuttle and a washing tub. The John Street property was to accommodate eight or nine. At the Pool Fold cottage (belonging to Miss Bird) the Belgian family catered for themselves. Weekly subscriptions amounted to 30s. This was collected by the Ladies Committee. They also collected 6s worth of groceries per week. Donations were received from schools, sewing groups and also from the Albion Fustian Mill employees. In a printed list of subscriptions, even the Biddulph Grange maids managed to donate 9d. Throughout March the Sentinel reported on various fund raising efforts. At a concert held at Biddulph Moor it was stated that “Biddulph Moor, in proportion to her inhabitants, had responded most nobly to the call.” Mention was made of Mademoiselle and Monsieur Vieminokx who had performed a dance during the concert. Fund raising events either dwindled or were no longer reported, with March being the last month in which anything appeared in the press. Reports of committee meetings to organise and distribute relief also seem to disappear after March. Perhaps this suggests that the Belgians had become accepted and valued members of the community and no longer required financial support. Occasional mention of them can be found such as in August 1915 in the Parish Magazine: a report of the ‘Patriotic Display’ held at Biddulph Central School on August 7th at which, during tea, the Biddulph Belgian refugees were to provide music and singing. The only photographic evidence unearthed of the Belgian Refugees is that reproduced above, courtesy of the Biddulph Museum. 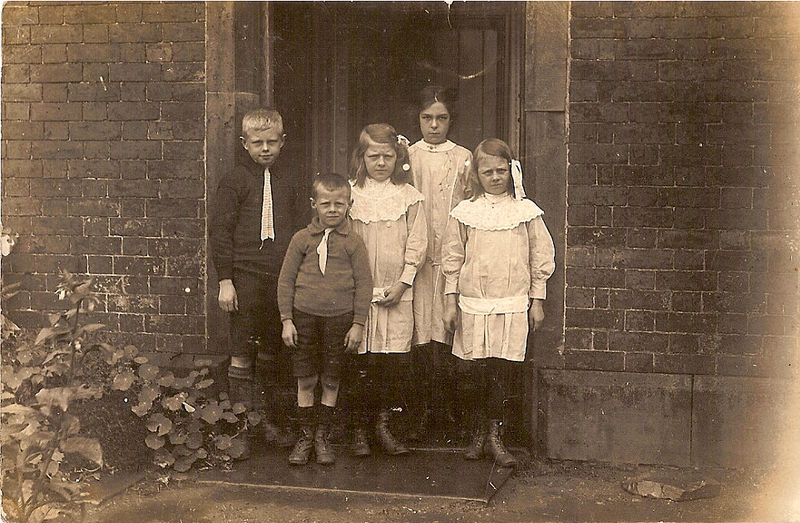 It is believed to have been taken at Knypersley Hall cottages in 1915. Reports in the local press and parish magazine all express positive opinions of the refugees in Biddulph with admiration for their stoic response to their situation. Although they only stayed in the town for a short time, they appear to have assimilated almost seamlessly with the local community and regularly participated in local events. Their return to Belgium, like their arrival in Biddulph, appears to have been a quiet and unassuming process.